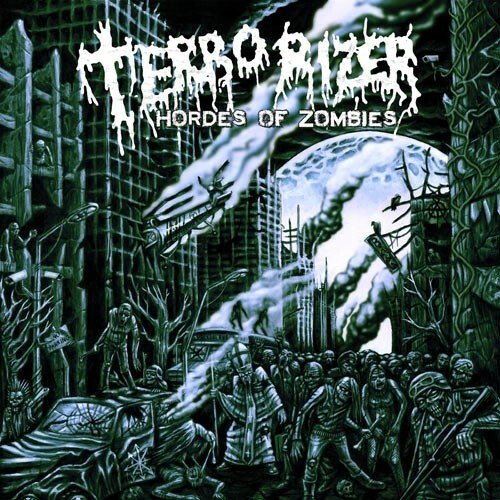 This is the album all fans of US Grindcore legend TERRORIZER have been waiting for! Since their famed debut “World Downfall” (1989) and the second full-length “Darker Days Ahead” (2006), TERRORIZER are regarded as the defining band of their genre. With “Hordes of Zombies” the Americans are unleashing a massive riff avalanche that amalgamates the most forceful elements of Death and Thrash into a true juggernaut of Metal true to this style. The legions of their adherents will be even more delighted about the return of MORBID ANGEL frontman David Vincent on bass. They will also be glad to hear that excellent singer Wolf aka Anthony Rezhawk (RESISTANT CULTURE) is again adding his resonant and fierce growls and Pete Sandoval (MORBID ANGEL) delivers yet another jaw-dropping drum barrage. TERRORIZER's excellent songwriting has sonically been refined by Dan Swanö at Unisound Studios. Get ready: the godfathers of Grindcore are back from the undead!